Discussion in 'Member Introductions' started by faizal, Jan 24, 2019. 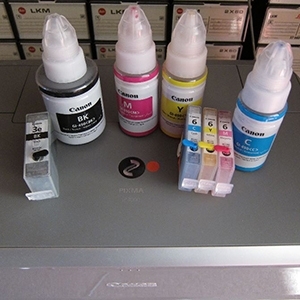 I use canon ib4170 + cis, heavy user, print around 6000 pages per month. Recently, after 85K pages, my ib4170 start giving me problem, black text is distorted & misaligned, but nozzle check & print head alignment is perfect, encoder film is clean & no debris inside printer... I am wondering whether anyone ever faced such issue before... is it time to replace printhead or printer...? Welcome to the forum, faizal. Hopefully we can help you with your issue. It is rare to hear about Canon printers using a CIS. Canon does not play nice with a CIS and requires a great deal of attention to maintain good function. Your post is the first I have heard of someone using a CIS with a Maxify. I am curious to know how many pages your Maxify has printed. Please post a clear, cropped and well lighted image of your nozzle check and also the distorted black text. Hi, thanks for the welcome & for responding. I'm surprised to hear that about canon cis, I've printed 86 thousand pages over 14 months, no jam, no air bubble, no clogging, this is the first real issue after 14 months. As you can see, nozzle is perfect, from the purge image, only black is not in alignment, the 3rd image is the sample text distortion. ps: Only happen to standard print on plain paper, high setting or any paper above plain, no problem at all. Have you tried an automatic alignment? Canon typically has a manual alignment as well if the auto does not work properly. The Black latticework nozzles in the 11th column from the right side seem slightly off. Whether this is an indication of the issues with Black in your purge and text images is debatable. The distortion in the Black text is almost as though the paper jumped a little ahead instead of smoothly feeding and that is why there is a small space without ink, as well as slightly askew. Given the higher page count printed, and maybe the environment the printer operates in (Dry? Hot? ), maybe the rollers are wearing and not gripping the page of this particular plain paper. Only happen to standard print on plain paper, high setting or any paper above plain, no problem at all. Using higher settings or different paper settings change the speed of the paper through the printer as well as how much ink is deposited on the page. As I said above, a different paper may feed not slip in the rollers as it is being fed through the printer. Have you tried a different plain paper at regular setting to see if it is the paper? OF course, none of this explains the purge image you posted. I do not know what it is supposed to look like but I imagine all ink swaths are supposed to be linear and not alternate block heights. These variable height blocks of Black may represent the width of Black ink deposited in a single nozzle pass. This symmetric appearance may indicate an irreparable electrical issue. I am interested to read other members opinions on this. Yup, the purge image is supposed to be straight. Sorry didn't explain. I use different brands of paper, no difference. Manual & auto alignment multiple times, no difference. Another forum suggested to do a manual alignment using thick paper stock, tried that, not working. Either way, I'm happy to replace, total ink costs plus printer cost divide number of pages printed = 1.67 cents my currency or USD 0.4 cents per page, excluding paper, cheapest ever compared to other printers I owned. Given the higher page count printed, and maybe the environment the printer operates in (Dry? Hot? ), maybe the rollers are wearing and not gripping the page of this particular plain paper. Beware: It is possible that an electrical failure in a print head can cause an electrical failure in the logic assay board of Canon printers. The reverse may also occur such that an electrical malfunction in a logic assay board can cause an electrical malfunction in a new print head. This is quite rare based on user reporting in this forum. There has been discussion on the forum of rejuvenating the rollers with a specific solution, not water or alcohol. Forum member @PeterBJ may be able to offer advice if I recall correctly who has spoken on this previously. faizal and The Hat like this. If the misalignment in black is dependent on paper quality/weight, then it is not caused by the print head or logic board or the encoder film/timing strip but much more likely by the paper rollers, so as @stratman warns, don't test the new print head in the old printer or vice versa. I have successfully used a special rubber roller restorer, the "AF Platenclene" for cleaning rollers in Canon and HP printers. Link here and here. Similar cleaning products are also available from other manufacturers. The problem with rollers losing the friction might be caused by paper dust. In that case HP recommends cleaning the rollers with a rag moistened with warm, not hot water. HP also recommends that you don't use alcohol or other solvent that might damage the rollers. faizal, palombian, The Hat and 1 other person like this. Thanks for all the tips, both of you, I'm gonna look for rubber rejuvenator in my local hardware shop tomorrow & test it out. palombian, The Hat, stratman and 1 other person like this.